Recent studies have demonstrated the existence of significant differences in fatty acid composition of the cell membranes of platelets between depressed humans and apparently healthy subjects. These differences were identified through the use of advanced mathematical tools. In particular an artificial neural network (ANN), the Self-Organizing Map (SOM) described by Kohonen (1982), was employed. The SOM isolated three fatty acids, arachidonic acid (AA), linoleic acid (LA) and palmitic acid (PA), and was able to map two different populations (normal and depressive), recognizing as similar subjects belonging to the same population. 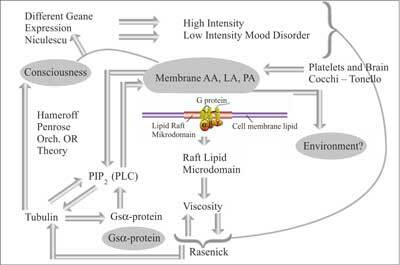 The work summarizes the main aspects that link platelets, brain and serotonin through lipid cell membrane viscosity. This seems to be, today, one of the most fascinating hypotheses in the interpretation of depressive disorder. The present work concludes with philosophical reflections about the new feature of technological depression. Key words: platelets, brain, fatty acids, membrane viscosity, serotonin, consciousness, technological depression. When tackling such a difficult and complex issue as depression, we face, inevitably, not only one of the great mysteries of the brain, but also a century of science on the subject that has, in essence, never used objective assessment tools but has cultivated a concept which abstracts the brain from its normal phenomenology, entering intricate research detached from reality of phenomena that affect intangible and unlikely causes. The brain becomes an external element to the physical, disconnected from the molecular evidence, and is played mostly in the light of socio-emotional relationships rather than linked to the possibility of endogenous errors, on which these relations have a relative weight or, if they have a weight, it is difficult to translate it into the dynamics of molecules involving inter-intracellular communications downloading those variable responses that are recognized as mood disorders. Some people think that reducing all to molecular aspects is reductionist if compared with the diagnostic classification of depression. If it is, you can easily imagine how even more reductionist is the reliance on symptom rating scales. What we have received from the particular research on depression is still, after many passages of interpretation have been made, almost incredible when we think of the origin of the same disease. The initial idea was to analyse the platelet membrane fatty acids of a group of depressed patients and compare them with those of apparently normal people (1-22). So far nothing exceptional if, viewing the results (tab. 1), we had not perceived that, despite all their traditional significance, they were useless as a diagnostic characteristic of depressive illness. Table 1. Significance of the results obtained from the comparison of normal and depressed platelet fatty acids. C 14:0 0.86 ? 0.59 1.02 ? 0.70 N.S. C 18:1 22.18 ? 2.08 21.14 ? 4.13 N.S. C 18:1 1.82 ? 0.64 1.89 ? 0.87 N.S. C 18:3 0.48 ? 0.16 0.73 ? 1.55 N.S. C 20:3 2.10 ? 0.76 2.29 ? 0.77 N.S. C 22:4 1.62 ? 0.70 1.60 ? 0.82 N.S. C 22:5 1.16 ? 0.61 0.98 ? 0.56 N.S. In fact, almost by instinct on the one hand and not to frustrate a lot of work on the other hand, it was considered if there was a way to process the data obtained that went beyond the trivial statistical calculation, and whether it could give clearer and accurate answers. Faced with what has been obtained, the first observation was that the mathematical problem of the membrane dynamic was complex, that is, not linear and, therefore, had to be approached differently. The idea was conceived to process the data using mathematical functions as artificial neural networks and in particular the Self-Organizing Map (SOM) (23-25). There began hard work of months until, almost like a countdown, the time came when we would be placed in front of the truth about the result. Who knows the procedures to show the SOM final result knows how the cases will be distributed on the map, and two things can happen: either they are mixed and therefore do not produce results because the target has not been correctly identified, or split because SOM has identified similarities with respect to differences between the parameters. In our case, the healthy and pathological subjects are clearly separated even though, as we shall see later, interpretations of the cases that were being blended with each other would have been necessary. Therefore, the network, which had received numbers and certainly did not know they were referred to biological entities, returned to us a conclusive biological result obtained by isolation of only three fatty acids and by the distribution of each triplet on the map (fig. 1). Fig. 1. Distribution of normal (green) and depressed (red) subjects on the SOM according to the fatty acid triplet (AA, LA and PA). It has been a long and difficult path to understand the meaning of the numbers and we have used mathematical considerations of various kinds to understand what meaning that unique number could have, derived by the three selected by SOM, which placed the subject studied at one point on the map distributing all cases without even overlapping one another. We understood that it was not possible to identify what relationship among those numbers had identified the SOM and, therefore, we applied a possible and plausible solution trusting that could provide a glimmer of light. We built a plausible operation that put in relation the three numbers isolated by SOM that was nothing if not the percentages of three fatty acids, of which, however, one was a saturated fatty acid and the other two polyunsaturated fatty acids. The result was that after verifying whether the transaction made sense for him and the three fatty acids accounted for the majority of the total of all fatty acids that characterize the platelet membrane, linking the molecular weight and melting point of each of the three fatty acids and their sum, we obtained positive and negative numbers, of course, according to the dominance of saturated or unsaturated fatty acids (B2 index). All results were redistributed on a map (fig. 2), this time mono-dimensional, and the surprise was that all cases coded by the number obtained by summation were distributed in a logical sequence in perfect progression from the more unsaturated (the depressed) to the most saturated (the normal). Fig. 2. B2 index distribution on a mono-dimensional map. It was therefore evident that the membrane characteristics of depressed subjects had a higher degree of unsaturation, a condition which makes membranes more fluid or less viscous. In fact we saw, in the characterization of depression, as arachidonic acid was of major importance, albeit in combination with others, being characterized by the highest degree of unsaturation. Our findings, moreover, were in agreement with the international literature data. We do not know if we were pushed more by curiosity or by desire to solve the problem, so we consulted some friends, world reputation scientists, who knew the job done and considered it of great interest. Not only that, our work seemed to provide them some glimmers of explanation even in their own work. We found ourselves in Italy and organized a discussion. To proceed in an understandable way it is correct to explain who they are, what they do and what scientific studies characterize their activities. It is good to start with Mark Rasenick, who, with his group, is studying important molecular aspects in the brains of suicides for psychiatric causes, then Stuart Hameroff, recognized as the father of consciousness studies, who, with Roger Penrose, applied in quantum computation the tubulin-consciousness step. Finally Kary Mullis (Nobel Prize for PCR) had successfully verified the procedures we adopted for the development of mathematical research, fortunately for us. To describe the details of the long meeting would be complicated and difficult, so we report the synthesis. The hypothesis that increasingly took shape was that, at the neuron and platelet level, was achieved, in certain circumstances, a molecular cascade that begins with the viscosity of membrane involving GS-? protein, hence the tubulin, which has a strong connection with it, and that everything could influence the conscious state. It drew so, according to real tests, the very likely possibility of a real molecular cascade which shows as a major mediator of the depressive phenomenon the biochemical characteristics of the membrane. We started from three trivial numbers and there was a clear link with consciousness. The step was as unthinkable as important as Kary Mullis stated that our discovery could revolutionize the world of medicine, philosophy and religion (26). The search of bibliographic information never found conflicts with the research, but gave strength to continue the road taken. In fact everything was turning into our hands and we began to perceive that what had emerged from that exceptional meeting brought much further than we thought and, inevitably, their encroachment into philosophy and religion. 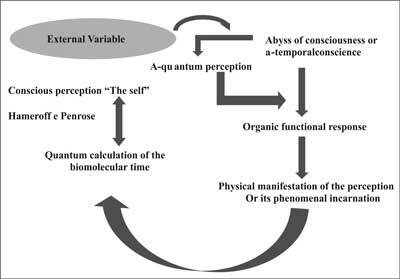 The molecular pathway of consciousness (fig. 3), of what we digest every detail and that only we know, took us to extraordinary thoughts that we will try to explain simply. In fact the path that we built was entirely plausible, there were, already, works that had measured, without molecular references, the frequency of ?-synchrony in different psycho-pathological conditions and in different stages of meditative intensity. If our reasoning was correct and ?-synchrony, as Hameroff believes (27, 28), is the best correlate of consciousness, then the path within the organism can be measured. Fig. 3. In figure is described the molecular depression hypothesis made according to Cocchi (Cocchi et al., 2008a), Rasenick (Donati et al., 2008), Hameroff (Hameroff and Penrose, 1996) experimental findings. Because of the possible similarity of platelets to neurons, the membrane viscosity can modify the Gs? protein status. The Gs? protein is connected with Tubulin. Tubulin, depending on local membrane lipid phase concentration, may serve as a positive or negative regulator of phosphoinositide hydrolysis (PIP2) such as G proteins do. Tubulin is known to form high-affinity complexes with certain G proteins. The formation of such complexes allows tubulin to activate Gs? and fosters a system whereby elements of the cytoskeleton can influence G-protein signaling. Rapid changes in membrane lipid composition or in the cytoskeleton might modify neuronal signalling through such a mechanism. It was precisely the concept of measurability, albeit through quantum computation, which led us to believe in the existence of possible intangible phenomena that could not be measured up to the body, of course, within the changes, on the inside, who could achieve this phenomenon (fig. 4). Fig. 4. Links between fatty acids (platelets and brain), Gs? protein, tubulin and conscience. Measurable by ?-synchrony? and European Psychiatric Association Conference on Treatment Guidance, Thessaloniki, Greece, 19-22 November 2009), a deep debate with a theologian opened the possibility of running a research project with the Faculty of Theology of Thessaloniki and the Orthodox Church. Kary?s words came true. It seemed possible, compared to something concrete, to slip outside the body finding confirmation that there could be, no doubt that indeed there is, an external variable that is outside the control of mathematical possibilities now known and is materialized in molecular sequences within the body, again measured using complex mathematical functions such as neural networks and ?quantum computation?. There arose at the same time the comparison with the animal and one could go on indefinitely in discussing whether the animal could be achieved by intangible phenomena or whether they have consciousness of self. Perhaps the strong guidance of our Christian-Catholic thinking, surfaced in mind that there was a condition that was certainly different between men and animals, that is the vocation. Vocation as an expression of an intangible external variable, unmeasurable in its path up to man, but that probably leads to a substantial modification of consciousness as the perception of self, versus immateriality of a phenomenon, of which we can measure (?-synchrony?) the final step. Essentially, it was theorized, at that moment, man as a biological entity that does not start or runs every perception within the neuronal circuit but that switches on the biological self from non-biological conditions. The adventure was fascinating, and soon after another event would take dignity of verisimilitude. There remained a fixed thought that depression, even for research performed on various animals, drew its origins from afar, i.e. from the stem cell that produces the neuron. Since it is now known that from the skin can be programmed a neuron, we obtained data on fatty acids of platelets from people with scleroderma. We posted in SOM fatty acid values, markers of depression, derived from scleroderma subjects (fig. 5, 6), with the surprising result that the distribution of scleroderma subjects over the SOM was exactly identical to that of depressed but not all depressed had scleroderma. Fig. 6. Distribution of depressive subjects (left) and scleroderma subjects (right). Again the literature comforted us and we showed that the incidence of psychiatric evaluation of depression, in scleroderma, was exactly like the one we found in the SOM (29). What does it mean? In our opinion it means that scleroderma and depression are two distinct diseases and not, as commonly thought for other serious diseases, that depression is a result of the disease. We realized that this view conflicted with what seems to emerge from scientific papers written about it, but it is really very likely that the characteristics identified in the neuron, derived from the skin of scleroderma subjects with overlapping features with depression, can show the original error (fig. 7). Fig. 7. Comparison between the platelet fatty acids of the two groups. This awareness has led us to think that, perhaps, some other serious diseases considered to cause depression are consequential. In this sense, and for reasons I will describe shortly, it was thought that like scleroderma also Crohn?s disease may be placed within the framework of depression. Why Crohn?s disease? 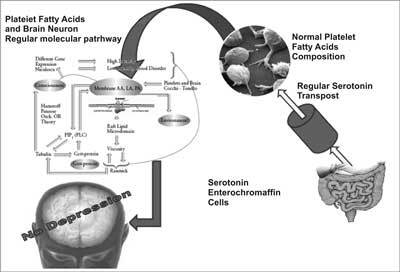 Besides the fact that Crohn?s disease shows a very high incidence of depression, another aspect examined, again to clarify as much as possible each step of the research, was the brain-gut connection (a very trivial and common reference) in the path of serotonin and insertion of a variable that is the transport platelet-brain of arachidonic acid (12, 13). We will try to explain it as simply as possible. 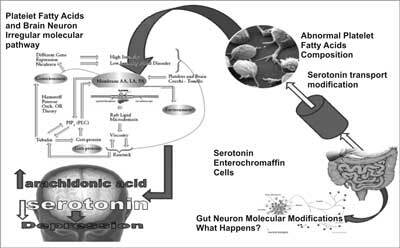 It is very well known that the greatest amount of serotonin is produced in enterochromaffin cells in the intestine (about 90%) and that the blood serotonin is stored in platelets, but they do not have the capacity of synthesis. Even the brain neuron synthesizes and produces serotonin, but cannot receive serotonin from the platelet because serotonin does not cross the blood-brain barrier. What can, therefore, be the connection between enterochromaffin cells, platelets and neurons, under the common denominator of serotonin, since platelets and neurons both have low levels of serotonin in depression and especially in light of the recognition of the platelet as the simulator of this neuronal disease? More simply, since there is no serotonin exchange between platelet and neuron, why do both of these cellular structures exhibit the same characteristics in depressive illness? A plausible explanation seems to be. With a complex trial in human and pig, scientifically recognized as the optimal model for studies of neuroscience applied to humans, and a complex mathematical calculation, we have shown that there is an exchange between platelet and brain arachidonic acid. In a simplified analysis of the problem we can say that in normal conditions, the platelet discharges arachidonic acid to the brain which, in turn, is re-downloaded to the platelet to maintain balance (12, 13). Under conditions of high concentration of arachidonic acid in the platelets the AA exchange does not work; therefore, the brain accumulates arachidonic acid that comes from other ways (fig. 8, 9). Fig. 8. 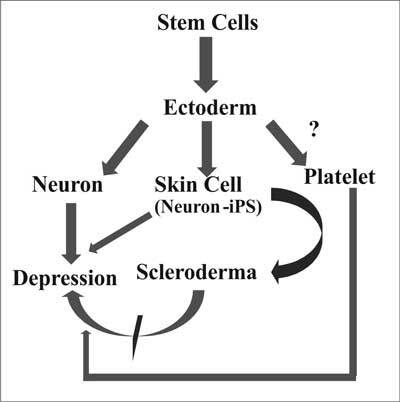 Diagram of the possible link between stem cells, platelets and depression. Fig. 9. Simulation of the conditions which would lead to an arachidonic acid-serotonin imbalance, involving membrane viscosity. Fig. 10. Simulation of the conditions which would lead to an arachidonic acid-serotonin imbalance, involving membrane viscosity. At this point it should be borne in mind that our data support, in depression, high levels of arachidonic acid, but others have documented it in plasma phospholipids (30) and brain of rats conditioned to depression (31). Further, it is common knowledge that there are low levels serotonin in both platelets and brain in conditions of depression. Where could the critical moment of the phenomenon be situated? We hypothesize that, in case of lack of transport or binding of serotonin by enterochromaffin cells to platelets, demonstrated by Boulin and O? Brien in Down?s syndrome (32), a high concentration of arachidonic acid corresponds to a low level of serotonin, which hinders the exchange with the brain, which found itself, like platelets, with a high concentration of arachidonic acid and a low concentration of serotonin. If there is one, what could be the link between serotonin and arachidonic acid? One possible view/assumption is that the increase of arachidonic acid changes or affects the viscosity of the membranes, certainly including the receptors? ones, with likely consequences for homeostasis of serotonin. In this case a link between enterochromaffin cells, platelets and neurons in depressive disorder, and perhaps in other conditions, would be plausible. In 1980 a relationship was found between serotonin receptors and lipid membrane fluidity: as the membrane lipids become more viscous, the specific binding of serotonin increases steadily. Signal transduction, either through activation of adenylate cyclase by the ligand-receptor complex or by microaggregation of ligand-receptor complexes, is associated with lateral movements of components of the membrane, which are determined, at least partially, by lipid fluidity (33). What is the role of the enteric neuron compared to the phenomena described and in particular the identification of the brain neuron molecular circuit? If what we assumed from Rasenick and Hameroff and from our research provides for the modification of the conscious state via the brain neuron, because the same molecular changes are also described for enteric neurons (by serotonin of enterochromaffin cells), could we say that the enteric neuron governs the state of consciousness? Will the post-tubulin path in the enteric neuron be measurable and what will it measure? We believe that the answer may be that the brain neuron governs consciousness (voluntary) and the enteric neuron governs peristalsis (involuntary). In practice the two neurons govern life, which would not exist without consciousness and without peristalsis. Will it also be, in this latter case, that serotonin will be revealed, among its many secrets, to be a great mediator of vital phenomena? Will there be combined conditions, i.e. 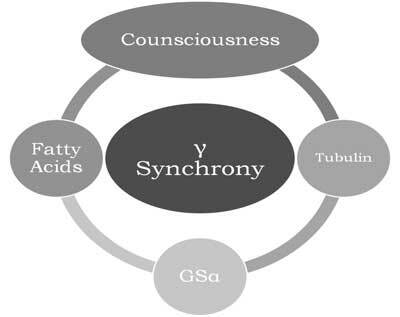 viscosity of membrane, arachidonic acid and serotonin that govern brain and bowel function, and if there is a mistake, can serious diseases occur? Pending questions, waiting a resolution, that teach us how scientific research cannot disregard the general observation of phenomena before going into the intricacies of molecular and/or genetic details, but only after you understand them. This research has also taught us that the appropriate use of mathematics, simple or complex, as a means of guaranteeing the understanding of phenomena, simple or complex, linear or nonlinear, is crucial. We had begun with three numbers! Approaching depression, as a general disease, with a mere bio-medical instrumentation not only appears reductive, all the more so in a magmatic and complicated society like ours. Instead, it is necessary to insert depression into a horizon of multi-purpose sense, in which the biological, physiological, and clinical aspects insert themselves in an anthropological and sociological field able to make them true. According to this point of view, the analysis by Ehrenberg (34) on the new feature of depression starting from the 70s appears persuasive: not more neurotic conflict between the norm and the transgression, but a lacerating distance among the results of our action on the world and other people?s unlimited expectations. Depression is not more conflict, but failure, checkmate, wreck of ego that is not able to push its action at the limit of the impossible. Briefly, we have passed from a society of blame to another one of shame, from Super Ego to a hypertrophic ideal Ego (on the dialectics blame-shame, also in the youngsters? world and its existential consequences: 35, 36). As Borgna shows us efficiently in the ?Preface? to the essay by Ehrenberg, La fatica di essere se stessi. Depressione e societ? : ?the symptomatic axe of depression moves itself? from sadness, from Stimmung?s melancholy, to inhibition, to the loss of initiative??. No more sadness, moral discomfort, sense of blame, but anxiety, insomnia, the fatigue of being oneself. If in depression, therefore, we do not see only a bio-medical event, a breakdown in the body system, a mere pathological classification (disease), but also a fracture of the symbolical perception (?all that I know about the world, also by the help of Sciences, I know starting from one of my perceptions or an experience of the world, without it the symbols of sciences themselves would mean nothing. [?] We must not ask ourselves therefore if we can perceive the world really, we must instead say: the world is what we perceive? : 37), a plot of unrepeatable experiences (illness) that the subject is not able anymore to articulate in a speech of normal sense, with a series of social relapses (sickness), we realize really the Titanic nature of the curative approach. A curative approach that must calibrate the diagnosis and the cure starting from the biographical and social body of the suffering subject, from the laceration of oneself that, as Le Breton continually remembers, jolts the relational certainty with the world. ?The great break that sets the consumerist cultural syndrome most sharply apart from its productivist predecessor, one that holds together the assembly of many different impulses, intuitions and proclivities and lifts the whole aggregate to the status of a coherent life programme, seems to be the reversal of the values attached respectively to duration and transience. ?The consumerist cultural syndrome consists above all in the emphatic denial of the virtue of procrastination and of the convenience and desirability of the delay of satisfaction ? those two axiological pillars of the society of producers ruled by the productivist syndrome. ?In the inherited hierarchy of recognized values, the consumerist syndrome has degraded duration and elevated transience. It lifts the value of novelty above that of lastingness. It has sharply shortened the timespan separating not just the want from its fulfilment (as many observers, inspired or misled by credit agencies, have suggested), but also the birth moment of the want from the moment of its demise, as well as the realization of the usefulness and desirability of possessions from the perception of them as useless and in need of rejection. Among the objects of human desire, it has put the act of appropriation, to be quickly followed by waste disposal, in the place once accorded to the acquisition of possessions meant to be durable and to their lasting enjoyment.? (39). The length of the quotation was necessary to pick up the existential reflexes of the consumer society, i.e., a style of frenetic life, forgetful of any deferments, clinging to a present consumed still before it happens, where the possession is functional only to a new possession, in a perverse circle of acquisition ? discard ? new acquisition. 2. Marked by what Bauman calls time at dots, without cohesion, of a direction of march, bent on itself, without an aim, expressive only of satisfaction of the present time, of the eternity of the instant, we do not articulate anymore the life inside a planning stage of a long duration, but in the hurried culture, in the rush culture (41), in the voracious consumption. It is so outlined, what Eriksen (42) calls tyranny of the instant: ?The consequences of that terrible rush are devastating: the past and the future as mental categories are threatened by the tyranny of the instant [?]. The threat, on the other hand, concerns with even here and now?, because the next moment arrives so quickly that it is difficult to live the present.? Briefly, we have become inhabitants of inauthentic anxiety, radically different from Augustine or Pascal?s one, linked to the original thirst of ideal realization of our contingent humanity, nerved only by a forced, spasmodic tension to consume each product frenetically, nearly to consume it like a vampire, in order not to be outside the market, i.e., the maximum regulator of belonging or less to the community. A genre of anxiety that approaches itself really to the one described in this clear passage by María Zambrano: ?An anxiety which is not that one of the other times, in which life was rich with adventures, because it is an anxiety that we bear, an anxiety in which we feel prisoners. It is an anxiety that comes from outside. It is not a liberating activity that springs from the inside; the most humiliating thing for a human being is to feel oneself taken, transported as only one option is allowed scarcely to him or the human being has hardly got a choice, without having the possibility to take any decisions because someone else that doesn?t take the trouble to consult him is going to take it instead of him. This passivity manifests itself in the most dreadful solitude. Beyond feeling ourselves restless, anxious, we are feeling ourselves subdued to a solitude without any pause. But the same thing happens with solitude as it happens with anxiety: also the solitude belongs to life of any time life, it is also situated at the bottom of the human life. The solitude of the era of crisis is however very different from the solitude of the wide-awake human being, since it is not due to a major lucidity and it can also include a major confusion. We are talking about a solitude caused by anxiety, because either we do not know or we cannot be certain about anything. We find ourselves so lonely because we are anxious and confused? (43). The crisis man, completely focused on productivity, efficiency, functionality and Market, is anxious because the existential field of technological possibilities that are offered him is so wide as to generate impotence and bewilderment. As a matter of fact, we cannot give up anything in order not to be expelled from the fictitious community created by the Market and, at the same time, we feel ourselves restless, anxious because, on the one hand it is structurally impossible to choose, where the choice, in the name of everything or nothing, is denied and, on the other hand, the research of more things, according to the sureness about what we have, is dangerous and, so, it could unhinge that same sureness, in a perverse, lacerated, perverse circle. 3. This turbo-consumerism has led to the production of a progressive and radical oblivion of the limit, of the temperance or ?right measure?, that is, of that anthropological dimension in which we decline life as acknowledgement of our own and somebody else?s finiteness; a way of life expressive of a society of economic frugality (44), of existential patience, of the necessary sedimentation of livings, projects, affections (45). From the turbo-consumerism anxiety a new type of man springs, as says Aubert, busy in the permanence, an urgency after the other one (46), connoted by an auto-referential staying in the world auto-referential, at the family limit, rocky, impenetrable from the outside and impermeable to any affective intrusion, bent on poor and specific biographic realities or stoned in the emotional indifferentism, expressive of a ?putting into brackets? of the person, prompted to the most shabby, managerial management of feelings (47). The new transcendentals of being, efficiency, efficacy, productivity, consumption, embodied by Technique as radical metaphysical expression, masked nihilism (48), impose a social visibility declinable in terms of unlimited working performances and perpetual individual consumption. Who does not bear is excluded and the exclusion must be paid with the stripping of oneself, with the shame that floods not rarely in depression (space does not permit us to make topics and develop the question dialectically if the technique is neutral and, therefore, the will of power and efficiency strike at the bitter end are going to be debited to man or if it is the technique to determine not only the means, but also the purposes of our actions, conditioning profiles of lives, choices, ethic articulations, deep meanings of history. In this position, we just suggest two essays: one by Galimberti (49), relative to non-neutrality of the technique, conditioning, on the contrary, our being in the world, and the other one by Nacci (50), relative to the innocence of the technique, i.e. as human incorporation and not entity by itself. In a world where a person counts because of what he produces and consumes, the questions do not bloom, the articulations of sensible alternatives to technological life remain outstanding, the ethical and existential provocations are not disseminated, because, having cut the questions put up by the soul for ever, everything is uniformity or indifferentism. It is understood, therefore, as in a context in which the person is assessed only on the bases of successes that he/she realizes, of the objects that he/she shows, of the products that he/she consumes hungrily, in the instant, depression is in wild ambush, its genetic predisposition is amplified, because temperament and emotion, nature and culture, biology and animology always interpenetrate themselves dialectically.